In the popular science fiction franchise Star Trek, there are two ways in which a ship can move. Impulse engines, and warp drive. Impulse engines actually exist. Impulse is just a physics term for applying a force over a period of time, so impulse engine is just a fancy term for rockets. In the franchise they are usually assume to be some kind of plasma rocket, but they are still just rockets. In fact, any engine that applies a force over time is technically an impulse engine. So the next time you climb into your car you can “engage impulse engine”. Warp drive is something entirely different. It allows starships to travel among the stars much faster than light, so it is clearly not conventional physics. As its name implies, it seems to rely on warping space to allow for faster than light travel. It is never entirely clear how it works beyond the fact that it relies of warp coils, dilithium crystals, and other things that can break down, threaten to explode or otherwise create drama. Given its vague description, it is usually assumed that any type of space travel that involves the warping of space is a warp drive. There are other ideas in science fiction, such as hyperspace, wormholes, inertia negation, etc. There are corresponding proposed physics for each of these, such as Heim theory, Dean drives, etc. These are typically viewed as fringe theories, and like perpetual motion machines they either don’t work, or their effects don’t mean what their inventors claim they mean. There’s a deep rabbit hole of “alternative” physics you can find on the internet related to these ideas. So where does warp drive stand in all this? Although warp drive was popularized by Star Trek in the late 1960s, it wasn’t until 1994 that an actual scientific paper was published on such a drive. It was then that Miguel Alcubierre published an article in Classical and Quantum Gravity titled “The warp drive: hyper-fast travel within general relativity.” This is a refereed paper in a respectable journal, so it’s not fringe theory, but the article is a what-if speculation testing the limits of general relativity. What Alcubierre showed was that there are solutions to general relativity that allow for an object to travel at any arbitrary speed, even faster than light. It does this by compressing space in front of the object and correspondingly expanding space behind it. This means that while the object itself does not travel through space faster than light, space is warped around it such that the space the object occupies moves from point A to point B faster than light would. This Alcubierre drive sounds like the warp drive of Star Trek, and in fact Alcubierre has said the science fiction concept inspired his idea. There is, however, a catch with this model, and it’s a big one. Just because something is allowed by general relativity doesn’t make it real. You might remember the Godel Universe I mentioned yesterday, which is allowed by general relativity but doesn’t happen to describe our universe. The same is true in this case. In particular, general relativity only describes the shape of space and time due to a particular distribution of mass and energy. You can make up any distribution you want in general relativity, even ones that are not physically possible. In the case of Alcubierre’s paper, his warp drive solution requires not only regular matter, but some kind of exotic matter with negative mass. All matter has positive mass, so it seems like the Alcubierre drive is only possible if we allow for a type of mass that doesn’t exist. So it’s an interesting idea, but not physically possible. Except that isn’t entirely true. Once again, physics seems to leave the door open just a crack. There are two things that might (or might not) fit the bill. One of these is dark energy. We see the effects of dark energy in the accelerated expansion of the universe. There are several models to describe dark energy. One of these models proposes a fundamental force known as quintessence. If quintessence is real, then it would have a negative energy density, which is effectively the same as negative mass. So if we could harness quintessence it could be exactly what’s needed for warp drive. Of course we don’t know whether quintessence exists, much less how it might be harnessed, so that possibility is pure speculation. The other possibility we do know exists. In quantum mechanics, the amount of energy in a region of space can fluctuate by tiny amounts. This is due to the uncertainty principle, which places limits on how precisely things like energy can be measured. These quantum fluctuations exist even in empty space. In an open region of space these fluctuations average out to effectively zero energy. But in an occupied space they may not average out. The most popular example is to have two metallic plates placed very close to each other (fractions of a millimeter apart). The fluctuations are basically free on either side of the plates, but are constrained between the plates. This means there are less fluctuations between the plates than outside the plates. As a result the plates have a net attractive force between them. This is effect is known as the Casimir effect, and has been observed experimentally. On very small scales the force can be relatively large. How this relates to warp drive is that outside the plates the quantum fluctuations still average to zero energy, but between the plates the fluctuations are less, which means the quantum energy between the plates is less than zero. In other words, between the plates there is a negative energy density. This is exactly what is needed for warp drive, so we just have to harness this quantum negative energy effect. Right? Maybe, and maybe not. The Casimir effect is a quantum effect. We don’t have a quantum theory of gravity, so we can’t be sure that this negative quantum energy would act like negative mass. It might, but without an understanding of quantum gravity we can’t be sure. So warp drive is hypothetically possible, but would require a “negative energy”, and we don’t know if that is even possible. Even quantum fluctuations or quintessence does allow for negative energy, warp drive might still require far more of it that we could ever practically gather. But what about NASA. Isn’t it true that NASA is developing a warp drive? Not quite. It is true that NASA has funded research on warp drive, but you shouldn’t read too much into this. Part of NASA’s mission is to push the envelope of space technology. That means sometimes they will spend a bit of money on a radical idea, and exotic propulsion concepts such as warp drive is one of them. You can think of it at being an investor. If you have a million dollars to invest, you would put some it in fairly safe, moderate yield investments, and some it a riskier, higher yield investments. But every now and then you might toss a few hundred dollars at a really high risk investment with the potential to make millions. You’ll probably lose the money, but you can afford to lose it, and every now and then you might win big. NASA’s funding of warp drive research is just that. Toss a little money at warp drive. It probably won’t work, but if it does it would revolutionize space propulsion. In the Star Trek universe the first warp drive is created in 2063. That gives us only 50 years to make it so. Next Time: Wormholes. Can we create shortcuts through space? Would it let us walk through a stargate to another world? Will we find out tomorrow? Indeed. I like how you used a render of my own personal re-design variant of the Enterprise in this article instead of any of the official CBS/Paramount Enterprises. Happens to me all the time! Even a comic book cover did it last month. Huh, I figured it was a publicity render. Do you have a link for proper attribution, or would you rather I switch it out for an official one? It’s a great image, by the way. Brian: I think you left out one thing in your commentary on the reasoning behind an investor like NASA, who is steeped in various fields of research, throwing a bit of mad-money at something that is unlikely to yield results that provide direct progress towards the stated goal(s) of the project being invested in. I think there is also something to be said of the side-effects/side-benefits that can come out of such an endeavor. It can often be the case that we begin by trying to solve one problem, and ultimately solve others that were not originally a part of the intended scope of the research. While the goal itself may not be achieved, unexpected discoveries have often sprouted from otherwise seemingly infertile ground. I believe this notion is an important one to elucidate wherein research-focused funding is involved. After all, if we only ever funded things that were certain to succeed, how many of today’s technologies that we take for granted could we say for certain would even exist? 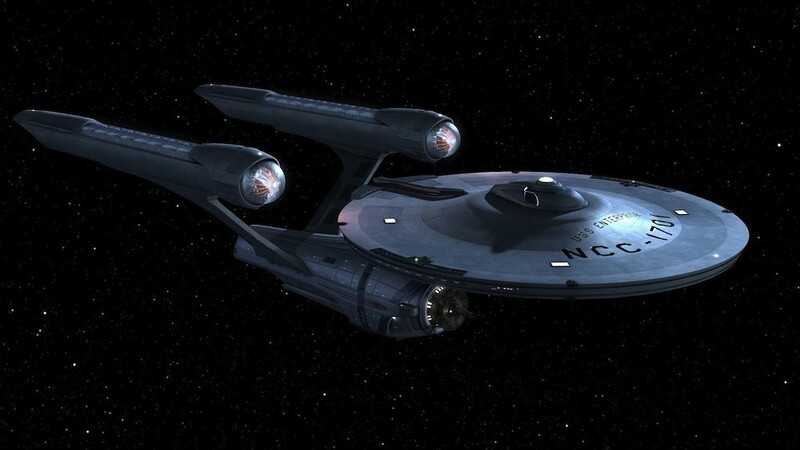 Gabriel Koerner: It is an EXCELLENT rendering of the classic Enterprise! Nice! Can you derive mechanical energy from the Casimir effect? If you placed two rigid plates at “Casimir distances” but with tiny springs mounted in the corners between the plates, would they compress and rebound continuously? If so, don’t you have a motor or agitator of sorts for “free”? Does it matter thy the plates are made of? What if they were made of graphene (supposing it were rigid enough)? What about U.F.Os? I didn’t believe them till I saw one and with the speed it was going through are atmosphere it should of burnt up. It got me thinking for something to travel that fast through are atmosphere its got to be a device that swipes the atoms aside to prevent the friction and stream lines the electrons to ride the electricity and the only technology that effects electrons and atoms is when we generate electricity, so I thought what if that energy was stream lined. When i was telling a friend about this and how it could be done he put me on to Professor John Searl who has invented a device that creates free electricity but the same device could fly to the moon in 1 hour. look him up. professor John Searl. I’m on an office chair right now. I’m going to turn, put my hands on the desk and shout “engage impulse engine!” before pushing the desk really hard.